I never like taking pictures of raw meat, so here is the chicken ready to be shredded. I only added about 4 ingredients and this recipe is a keeper. Have you tried this trick for shredding your chicken? OMG it makes it super easy and you can do this one right in the slow cooker pot since you want to blend the juices with the meat. Just take out about a cup of the liquid to serve with the sandwiches. 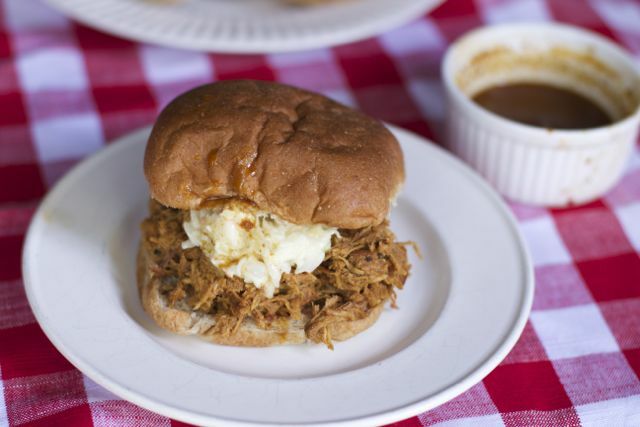 Look how perfect this slow cooker pulled chicken is! 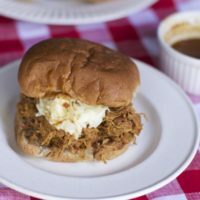 Top each sandwich with a dollop of cole slaw and any additional sauce for a quick and easy dinner everyone will enjoy. Coat all the chicken pieces with the mixture. When the chicken is done cooking reserve a cup of the bbq sauce. Use a fork or a hand mixer to pull the chicken apart. 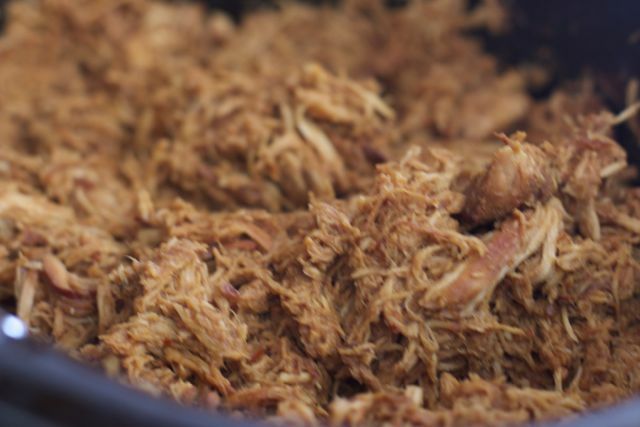 If you take the chicken out stir the pulled chicken and bbq sauce together in the crock pot otherwise use the hand mixer in the crock pot with all the juices. You can double this recipe too. 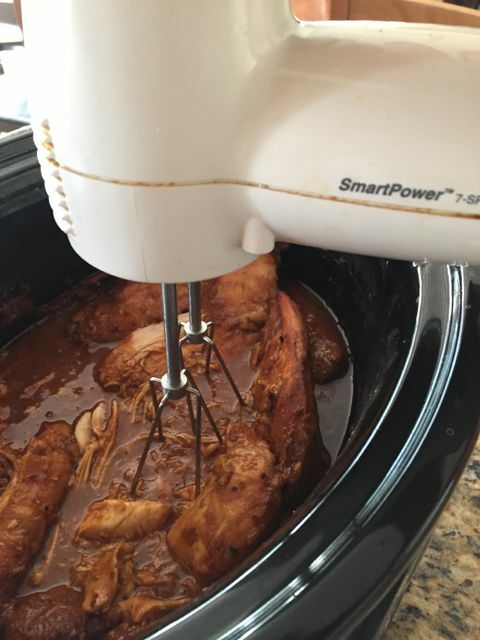 Be sure to check out all these other amazing slow cooker recipes from amazing food bloggers! You can use frozen chicken too which is great. I know why didn’t I come up with this ?? Julie I love it for comforting soups in the fall. 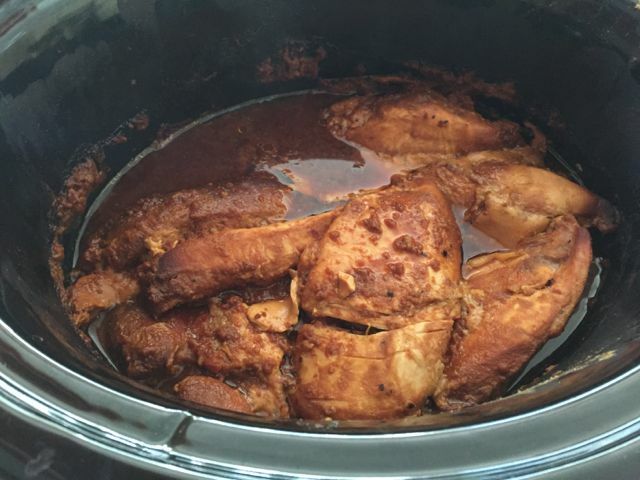 The crockpot is seriously a working mom’s best friend – when I’m out of the house for 10+ hours a day and want to spend some time with my toddler, it’s so great to toss something in on my way out the door and have dinner ready when I get home! 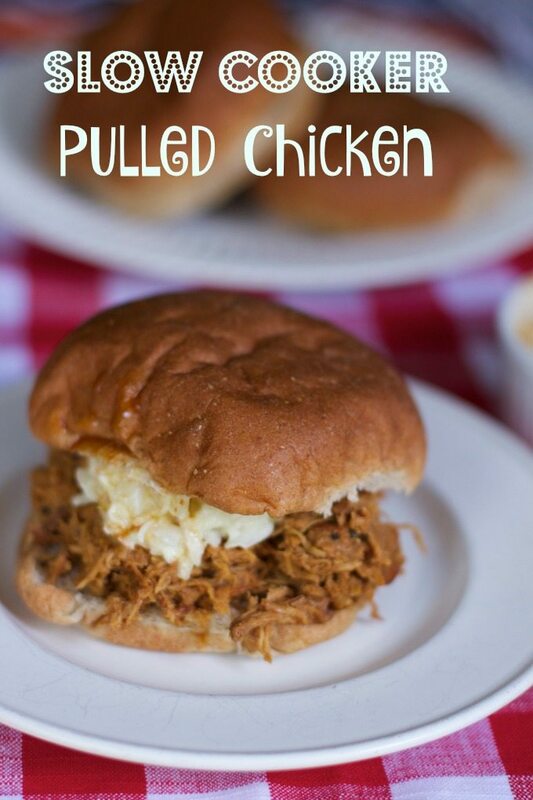 Hi Maria, this pulled BBQ chicken looks super yummy! I don’t pull chicken that much, mainly pork, but you make it look really easy so I’ll be giving it a try. Thanks a bunch! This sounds so easy and delicious. I’ve heard of shredding chicken in a stand mixer, but not using a hand mixer. That would make this so much easier. Thanks! We have a lot of chicken in the freezer I need to fix, this looks delicious.